I asked my friend Deb to take photos instead. I thought I had shown her the zoom function, but maybe not. 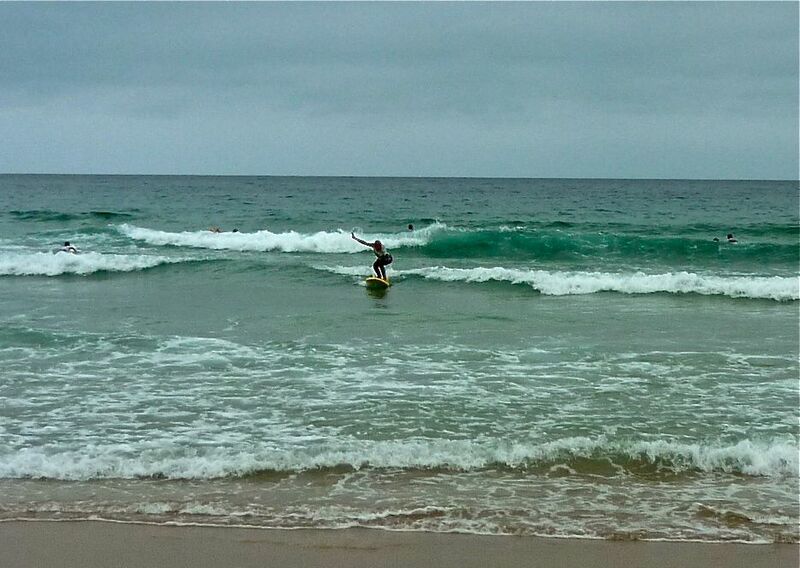 When Deb told me that she got a picture, I envisioned an image of me looking badass on the board. What I didn’t expect was that you would not be able to identify me at all. I was grateful that Deb took photos, but Kurt probably could have looked out the window of our hotel and gotten the same shot. Below is an enlarged version in which you still can’t tell it’s me. For some reason, my arm and hand look abnormally long in the photo above. Then I noticed that my once-again-extended arm looks quite short as I wave in the photo below. 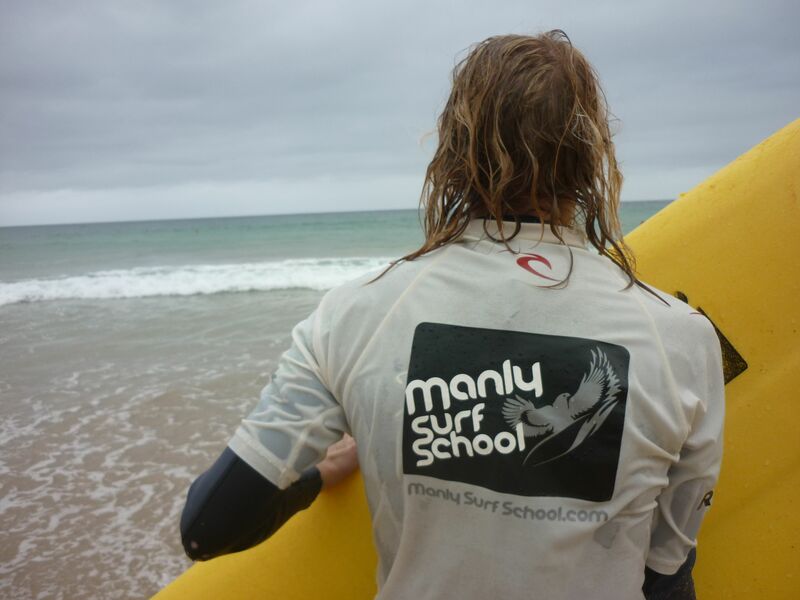 Kurt took this shot of me wearing a Manly Surf School rash guard at the end of the lesson. And I look, manly, indeed! I’m a bit broad-shouldered and I joke about my alter ego, Helga, the East German swimmer. Actually, I think I look a bit more like a less bulky Fabio with a shirt on. 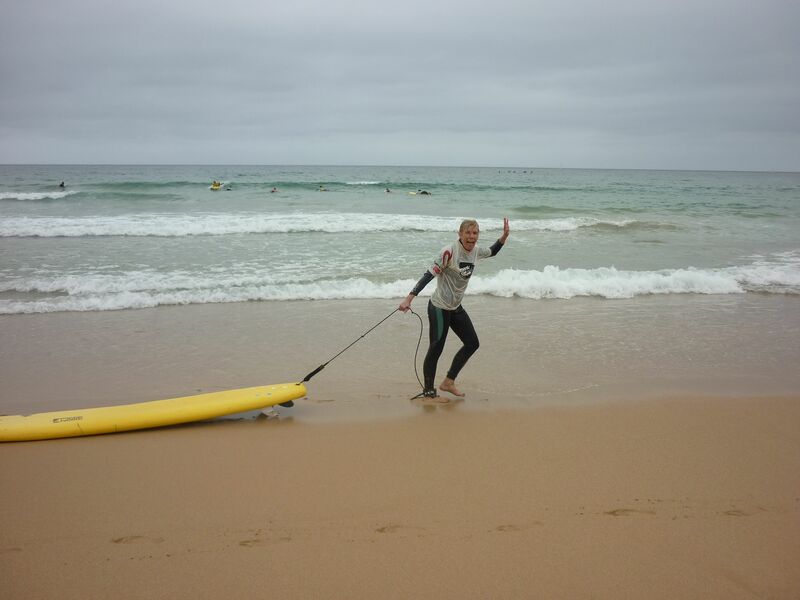 This entry was posted in Australia, Humor, Surfing, Travel, Travel Humor, Uncategorized, Unfortunate Photos and tagged awkward vacation photo, looking like Fabio, Manly Surf School by stephglaser. Bookmark the permalink. I can see the resemblance to Fabbio. I think it might be the stringy hair! 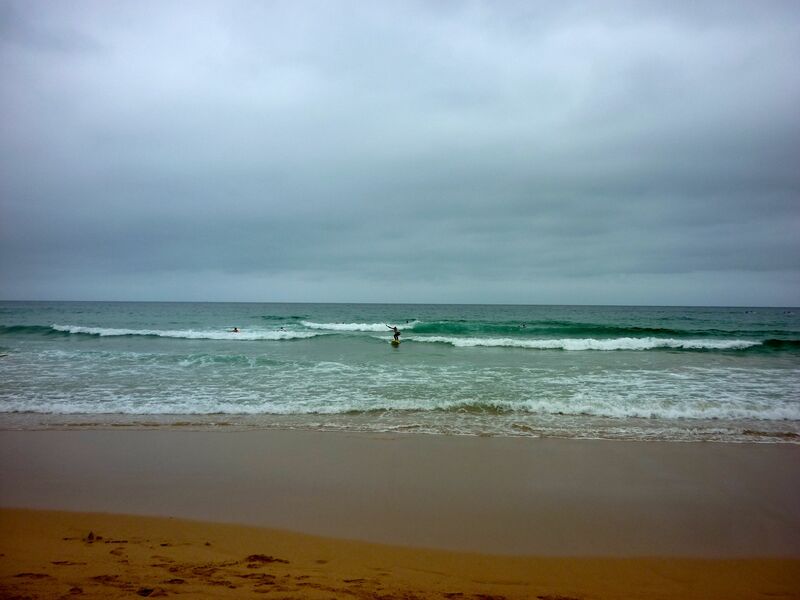 I could just make out a surfer….somewhere. Do visit again, and I’ll be back. I am reminded of the pictures I took of my husband surfing down the sand dunes in NZ. The sun was in my eyes, so all I got was the dune, no one there. It`s a very long climb to the top. He wasn`t going to do it again for the photo op. I didn’t realize how hard it was to take surfing photos until I tried to take them of my husband, Kurt, surfing at Port Noarlunga in SA. It’s hard to get a good action shot. I didn’t appreciate that my friend Deb had a bit of a hard task on her hands! Thanks for the comment.